We were determined to drive out for the weekend, on a "serious" trip. Since I came to the U.S. we did not get out much, only for a day or an afternoon. 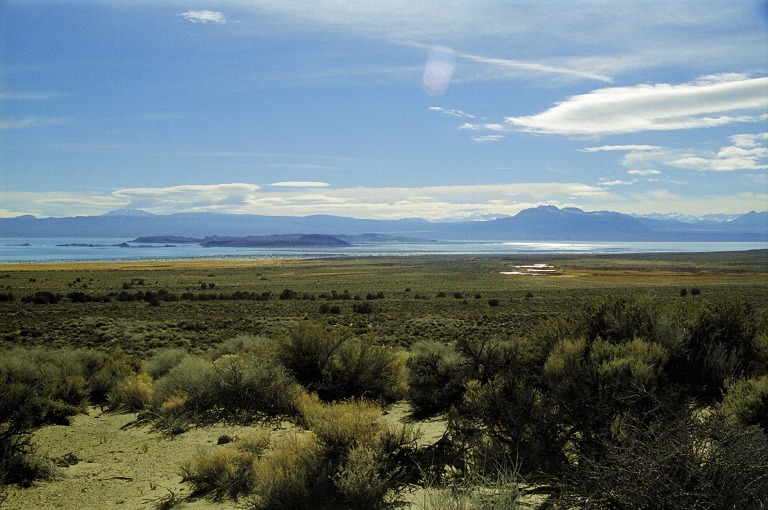 So we wanted to enjoy it again, and we decided to go to Mono Lake. 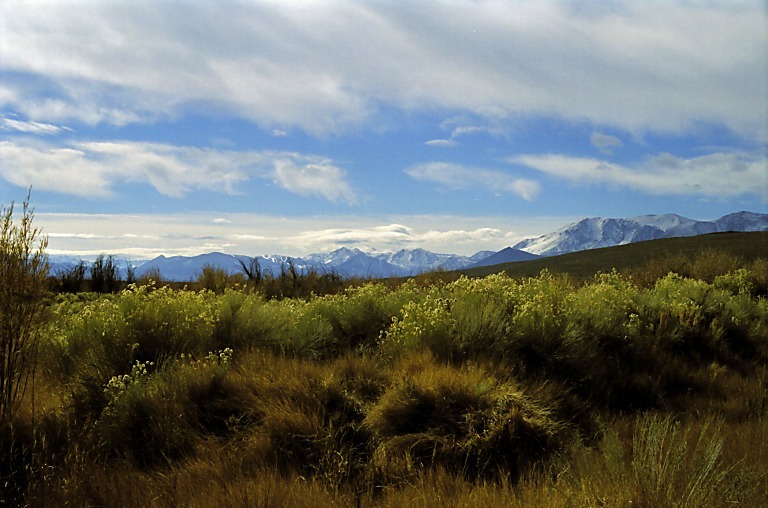 The said is located on the other side of Sierra Nevada, beyond Yosemite National Park. Mono Lake is kind of American "Dead Sea", only not even closely as dead as it would seem. Though it has no outlet, therefore is 2.5x more salty and about 160x more alkaline than an ocean, there are flies that live there who feed on the water. In their gastric tract they harbor bacteria that break down minerals and subsequently get digested by the fly. The fly then gets eaten by a duck or an Indian and so forth. The name of the lake comes from the word Monachi, which means "fly people" in the language of Yokuts, who called so their neighbors, one of Shoshoenan tribes. Shoshons used to live at the lake and eat pupae of the mineral-eating flies. 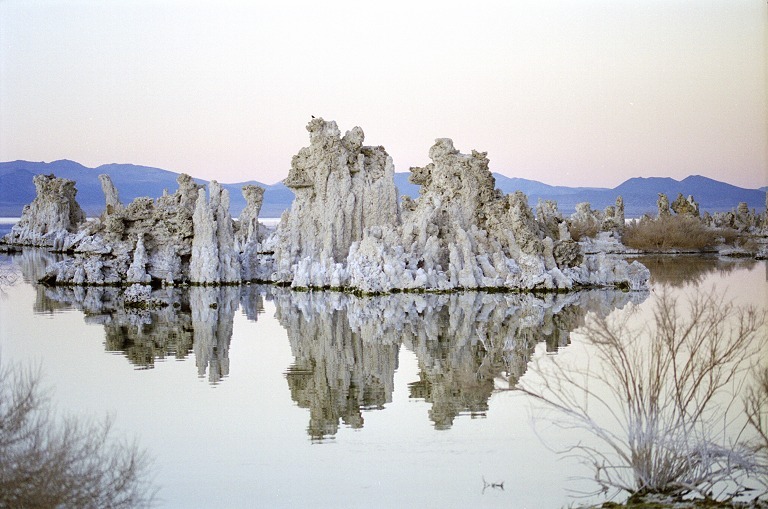 Mono lake has formed inside a collapsed volcanic crater, so it still gets bubbled through by various springs and hot gases, saturated with minerals. They are the source for so-called tufa. 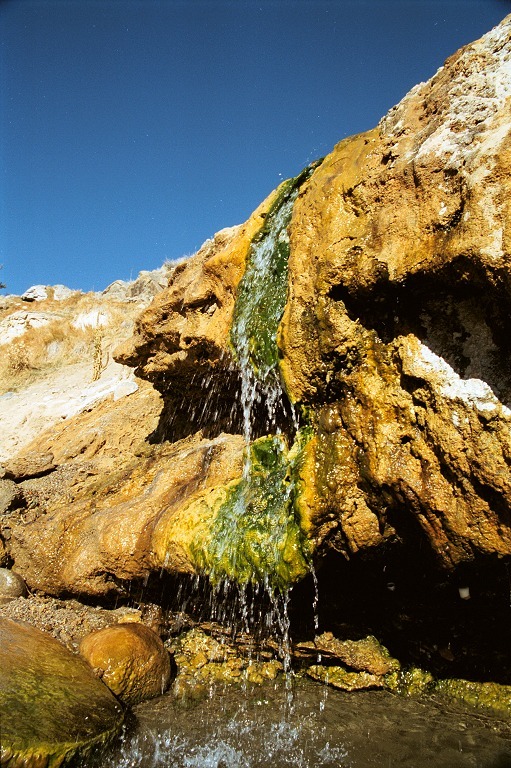 Tufa grows as mineral sediments surround a spring, until they form a column, which reminds of a limestone stalagmite. 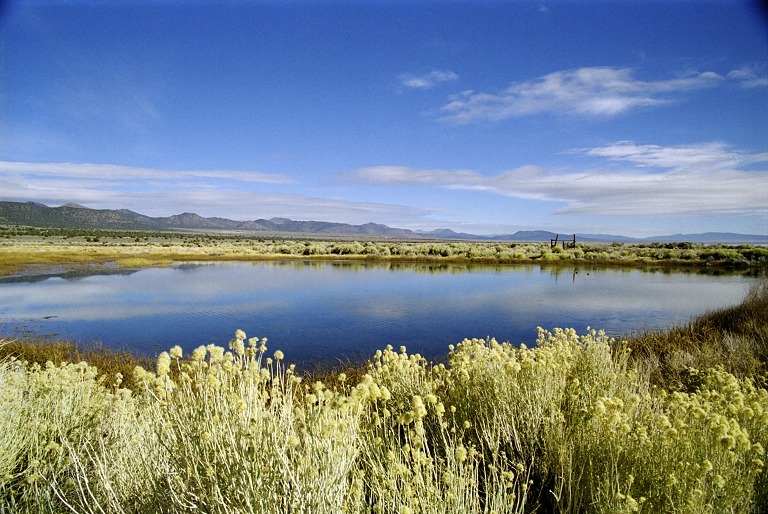 Rivers flow into Mono lake, but Los Angeles tapped five of them for water, since it is built practically in a desert. That lowered the water level in Mono dramatically (by about 50 feet) and tufa became visible above. 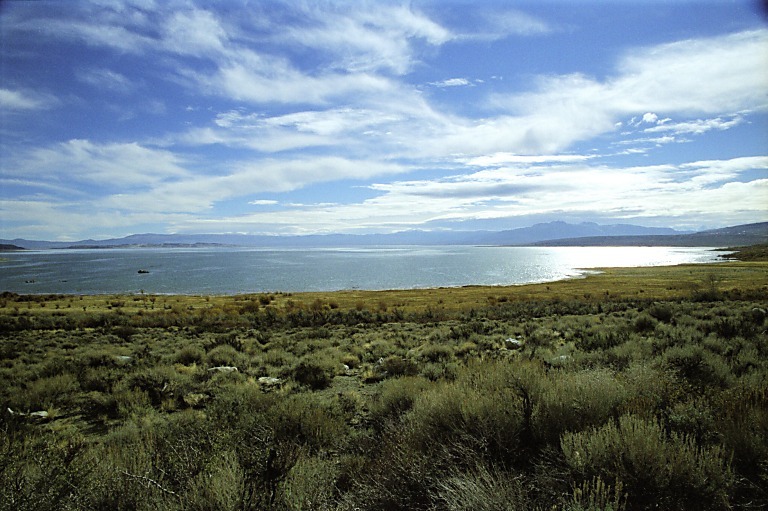 (Un)fortunately, Los Angeles was forced to stop taking so much water and so since 1994 Mono lake grows again. 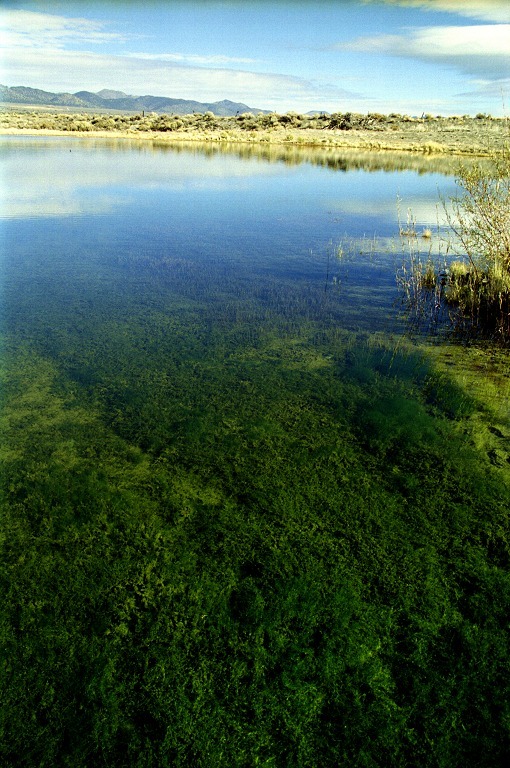 Which means that if you want to see the tufa, you only have a few years left until it all disappears under the surface. We wanted to go to Mono lake through Yosemite, but it said on internet that Tioga Pass was closed, so we headed to Sonora (i.e. to north-east) instead, where we planned to overnight and then on Saturday cross Sonora Pass to Mono (to south-east). I was supposed to pick up Sid at two in his work, but it somehow got out of hand and instead I arrived there by half past two. On top of it, Sid got pulled into a meeting, so we eventually got on the road by some four o'clock, and almost reached the point of marital conflict. Beginning at about three, freeways turn into parking lots, hence for next two hours or so, we lurched forward on first and second gears. All this because American Dream includes home ownership. Only the rich can afford to have a house in the Valley, as a house starts somewhere below a million (dollars). But for an average American, a HOME is a living necessity, so many people solve it by buying a home elsewhere, e.g. by Fresno. Fresno is a stinky middle of nowhere big town in a boring plain, dirty, with a huge unemployment rate, and houses are CHEAP there. Our desperate dreamer buys a home in Fresno, sentencing himself to spending two to three hours in the morning and two to three hours in the evening, in a commute traffic. And we hit exactly such traffic. Another marital crisis was thus averted by a dinner an some rest (that is, if you agree to consider critical a fact that Sid NOT SPEAKING for a while), and we decided to make a wider detour further north, overnighting at Tahoe. 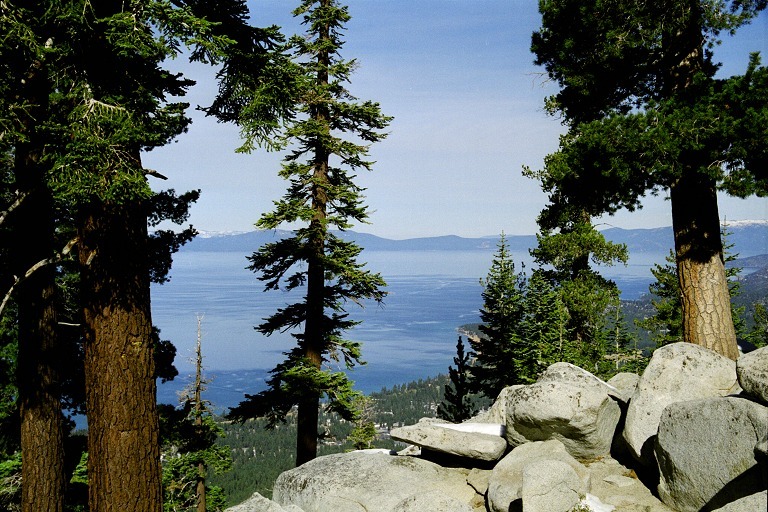 I remember Tahoe with mixed emotions, because that's where we ran into a bear in summer, but I concluded that every well-behaved bear would be fast asleep in his bed in November, and would not roam the woods. On our way to Tahoe we gained some 7000 feet elevation, snow was everywhere and the moon shone on it all, simply beautiful. We passed some policemen in the pass, but they were busy dealing with a big boulder that rolled onto the road, so they were marking it up with portable signs and apparently were organizing some clearing effort... that's how I like it here, that cops take care of such things and don't go around harassing people -- unless you break the law. I think that there is no such thing like a random check, and each owner is responsible for the technical state of his vehicle, and nobody ever checks that. Even with our tent and mattresses and sleeping bags we brought along, it was still too cold outside, even just by looking out of the car window, so we thankfully landed in a motel at Tahoe. 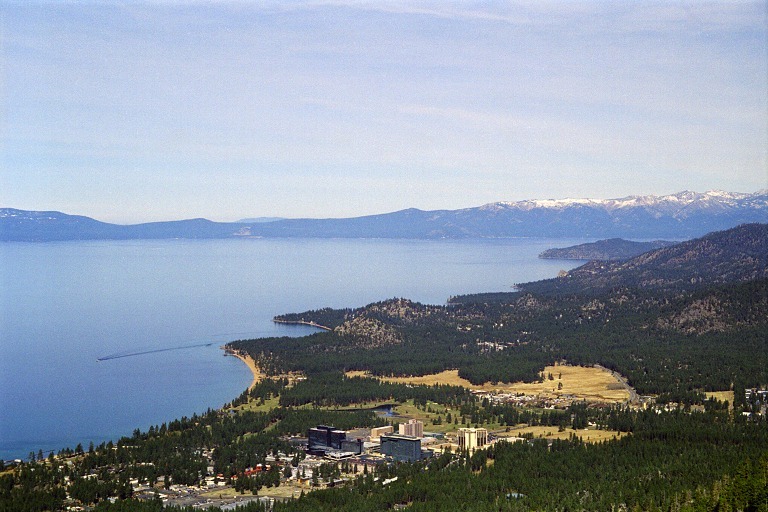 Lake Tahoe is located on California - Nevada border, which is probably the only interstate border that I ever got to notice. Besides a "local folklore" in the form of grocery check points on the way home (one may not import agricultural products to California) there is one more advantage -- after skiing you can run over to Nevada and spend a wild night at a casino (Nevada practically thrives on gambling and supports it by low taxes). Nothing against gambling, but an architect who erected skyscraper-bound casinos and hotels at Tahoe should immediately turn in his diploma. In the morning, a cabin tram took us up half way on a slope called Heavenly. Ski lifts and snow sports continue uphill, but this time they were still dysfunctional, as it had snowed only last weekend and not since, so there wasn't that much snow around. For a while we hiked around a few hills (wonderful winter weather - snow, warm and sunshine), we had ourselves a brunch in a fancy restaurant on the slope. The cook, however, had no sense of measure and overchillied all my food (how would you call it, applying too much chilli), so there was actually no flavor at all, it was just burning. From Tahoe, we eventually headed for Mono. On our way we stopped at hot springs. This is a great device, where you arrive, take off furs and shirts, and when you're naked, you drop into cozy warm water, pines above you, snow-tipped mountains on the horizon... there is one natural pool for two or so on top of a slope and then more hot streams flow into a creek. It's a lot of fun, because you sit on one side of a mountain creek, splashing merrily, and icicles drip on the other side. The only negative part of the whole affair is that you sooner or later MUST get out of the water. These sprigs have one more plus - they are natural and unofficial, so you can skinny-dip. At last, we emerged with a wonderful feeling of cleanliness -- minerals must have some effect on your skin, for you feel quite different than after a tub bath. We wanted to reach Mono Lake before sunset to still get to see it. Being one day late compared to our original plan -- closed passes meant substantial detour (just like going from Prague to Vienna over Warsaw). Still our timing has worked out and we managed an evening walk among tufa. Tufa rocks are up to thirty feet high (says printed guide) and in one spot form a real maze. I felt a little like inside a limestone cave, but without my usual claustrophobia. The Lake was bubbling and burping, ducks splashed around. I could not resist and tasted the water to check out whether it was really awfully salty. It was. As the night descended, we found our place at a motel for the night, name was Murphy's (I think) and I can only recommend it (it was extremely clean). The owner told us that Tioga Pass got opened at noon. And we rejoiced that we were able to take a direct way home, through Yosemite, that is. In the morning, we went to see pools that contain hot springs. These little ponds do not freeze over in winter and they are allegedly full of ducks. 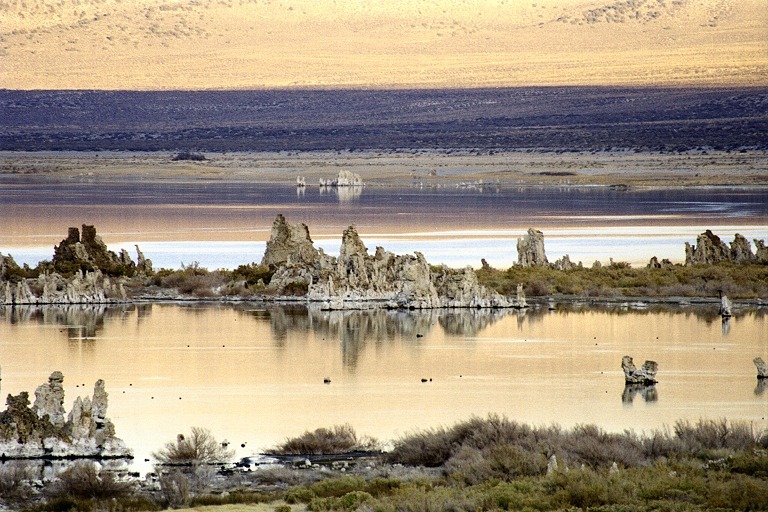 Originally they were part of the Mono Lake, but as the surface descended, the pools separated and finally people made dykes around them. I though they would be warm just like the hot spring up the road, but I was disappointed. No dipping in that! Neither ducks were abound, perhaps it was too early for them. We still wanted to circle the lake on some dirt road, but we got lost in middle of nowhere. Desert means bushes and little trees, just tall enough to prevent you to see from the car where you're going. Now add youngsters who occasionally speed through in their jeeps, creating new roads, and you get a perfect maze. Roads are tracks in sand among bushes. Volcanic dust and sand are fine and light - grains contain air bubbles, an ideal material to get your car stuck. As our wagon is not really an all-terrain vehicle, and since we forgot our GPS CD at home, we started to wander through the desert rather aimlessly. We gave up and returned to the highway. Anyway, it was time to go to Yosemite. Copyright © 2000-2005 by Carol & Sid Paral. All rights reserved.